The Crowne Plaza Hotel in Natick. 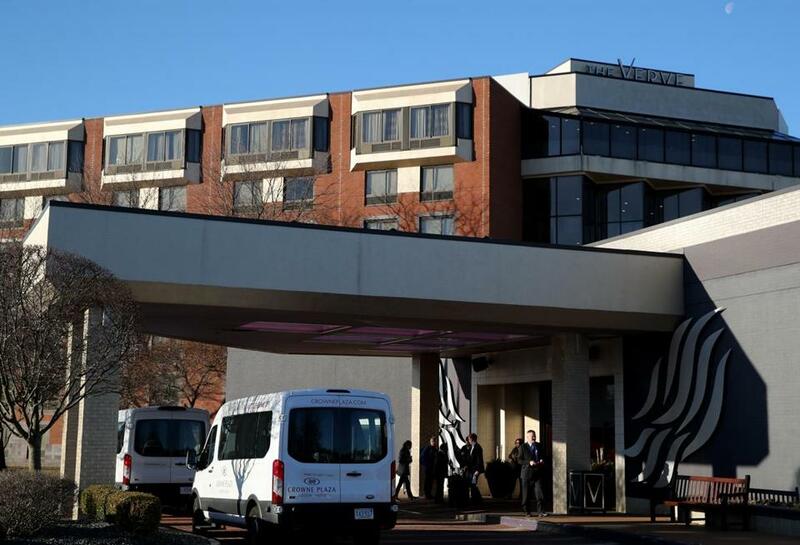 NATICK — A guest was shot early Tuesday in the lobby of the Crowne Plaza Hotel, leading to the evacuation of more than 75 guests who found shelter at the neighboring Natick Mall or in their cars in the hotel parking lot, officials said. The guest, who was not identified, was not struck by the single gunshot that was fired by one of several suspects in the lobby of the Route 9 hotel, Natick Police Chief James G. Hicks told reporters. A video released by authorities showed the harrowing scene: One person runs into a glass sliding door that appears to be activated by motion sensors. The door heaves outward as the person crashes into it before they are able to squeeze through a small opening. That person then stumbles before running off. The person was pursued by a gunman, who was dressed in dark colored clothing and a hat, according to the video. The second person approaches the small opening in the door and extends their arm through it with the gun, firing a shot. The shooter then retreats away from the door. Hicks said none of the guests or staff was physically harmed during the incident that began around 3 a.m. By 6 a.m., the hotel had been searched, and none of the suspects was found, he said. The chief said that the guest apparently targeted by the shooter is being interviewed by police and that surveillance video from the hotel security system is being reviewed for help in identifying those involved. He said the guest is being asked to retrace his steps in hopes that may lead to a reason for the attack, which brought SWAT teams from State Police and a regional police agency to the scene. Natick police evacuated “several of the hotel guests” in an abundance of caution, according to a statement from the department released Tuesday night. Authorities searched the area and reviewed the building’s video system. In the statement, police said the shooter is unknown to them. The person who was shot at suffered a minor injury not believed to have been caused by the gunfire. “The manner in which the victim and the assailant came to know each other and what precipitated the event are at task,” said Natick police in the statement. “We do not believe this event poses any additional threat to our community. Anyone with any information is encouraged to call Natick detectives at 508-647-9520.